ducati - don't join the movement to ruin motorcycling by over hipsterizing!!!!!!! 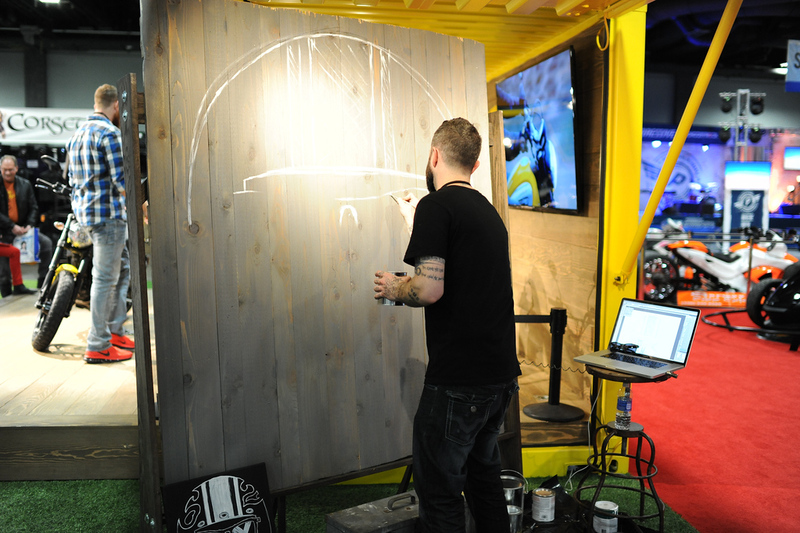 Ryan was a super nice guy, local to the Virginia area, and Ducati asked him to do the mural and I think it's going to a local Ducati dealership. He didn't need a full 3 days to complete the mural, but he was staging it out so that it would purposely take all 3 days, and use the time to interact with guests of the show. 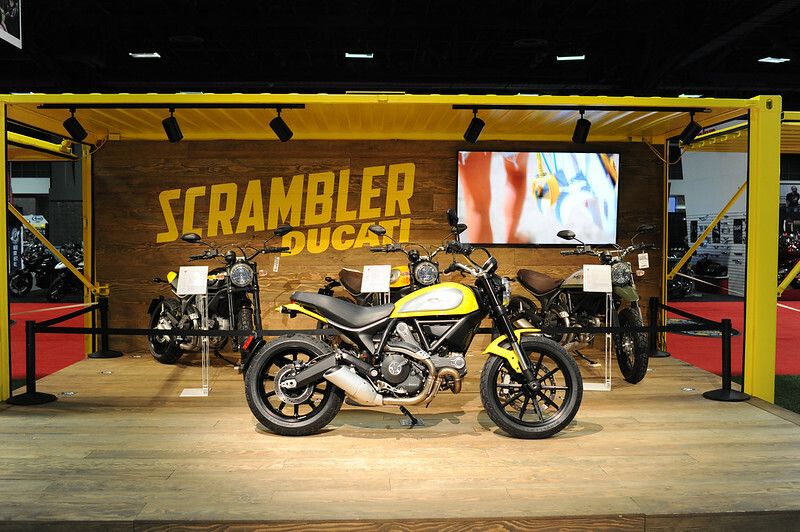 The Scrambler booth was packed at the show, and Ducati is investing a megaton amount of resources towards marketing this new model lineup. The 4 Ducati Scrambler motorcycles at the IMS were all pre-production models. The 3 versions behind the roped off area had several clay parts, and they would have broken had anyone sat on the bikes. Even the one model that you could sit on, if you looked close enough at the bike, you could see many smaller details were not complete. 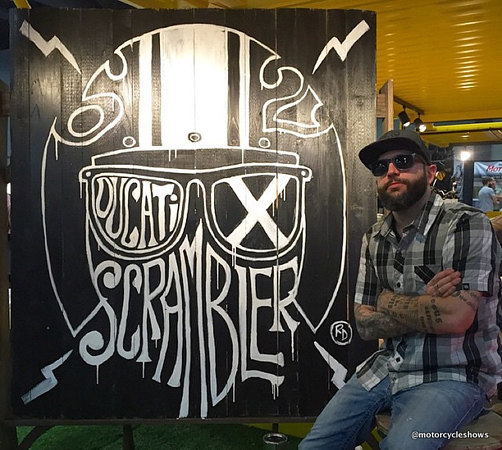 The Scrambler will be going into full production in the months ahead. 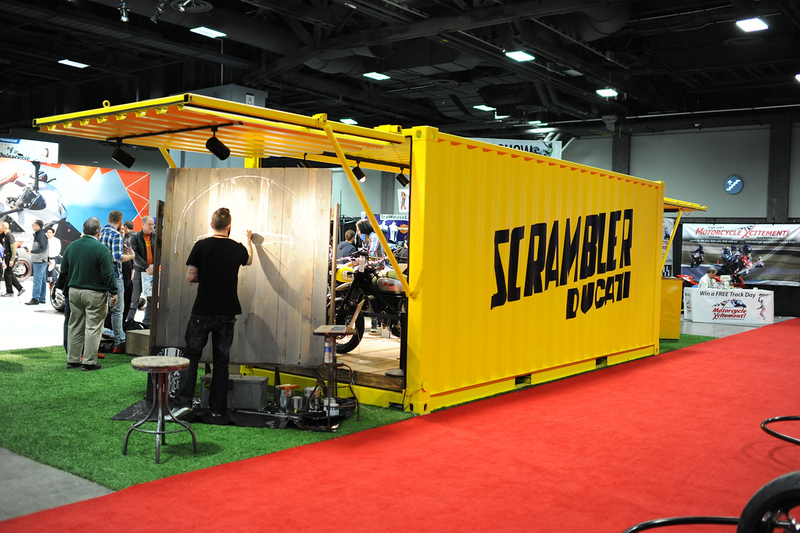 I'll be posting more Ducati Scrambler pics from the show in the next day or two. I'm sure he's a nice guy. And I have weakness for giving in too easily to snark sometimes. But this is what bothers me about Ducati and the Scrambler in particular. I'm sure they're going to sell a ton of these. And I'm sure they'll be well made, easy to ride, appealing to the masses, etc. And Ducati will make a pile of money off of them. Fine. Nothing wrong with making money. That's kinda the whole point. But does anyone believe that marketing resources and focus groups could have ever produced a 916? Thomas Kinkade made millions painting and marketing those "points of light" paintings. But his are never going to be in the Louvre. Ducati, pulling in all that money from their Scrambler group, runs the risk of forgetting that that they made their name, not by chasing after a market, but by creating their own. already been to the show in ny back in dec. saw this pos bike. so ugly so much money being put in yet smart on ducatis part to take a bunch of parts from the scrap heap and make a bike hipsters would think is cool and since it has a ducati name think is expensive. if your going to get the ugliest bike ever made just get the triumph Bonneville just as ugly half the price.